I found this postcard in a wonderful antique store in Berkley, Michigan. If you are ever in the area, please check out Oddfellows Antiques. They have two floors of treasures just waiting to be discovered. I thought this would make a great posting in honor of the 143rd running of the Kentucky Derby. It is scheduled for this Saturday (May 6, 2017) at the famed Churchill Downs in Louisville, Kentucky. 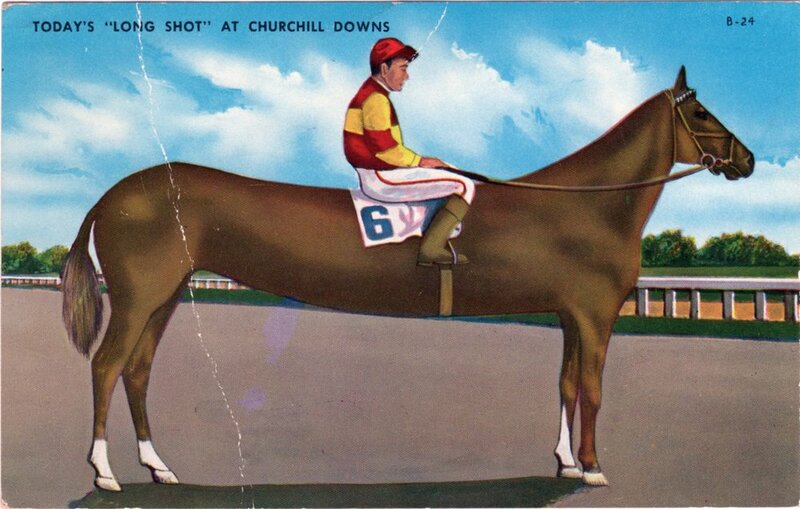 "Long Shot at Churchill Downs"
The postcard was sent in December of 1957 from a Holly and Christine. It is addressed to a Mr. and Mrs. Norman Carter on W. Holihan Rd. in Saginaw, Michigan. It was sent from Winfield, Tennessee, likely on the senders' trek south, as referenced in the text. I don't think Norman has a horse like this in his collection. Having a delightful trip. Weather still cold here but by end of next week will be in sunny South. Stay well. A cursory search on Ancestry did not turn up anything obvious as to the identity of the postcard recipients. While there were some Norman Carters listed in the 1940s census in Saginaw, MI there were none that matched up with "W Holihan Rd." A 1950 census might be helpful, but those won't be publicly available until 2022 (check here for some more info on the 1950 census). There were also no Carters on "Holihan St." in the mid 1950s city directories for Sagnaw. There is a "Houlihan" St. in Saginaw, however. Still no Carters though. With some more digging we could probably identify Mr. and Mrs. Carter. But that is not necessary for our purposes. Let's all just enjoy a colorful, humorous, 60 year old postcard that celebrates the national treasure that is Churchill Downs. The real long shot for the 2017 Kentucky Derby is a one eyed horse name, well, "Patch" of course. True story! Happy Derby Day 2017! 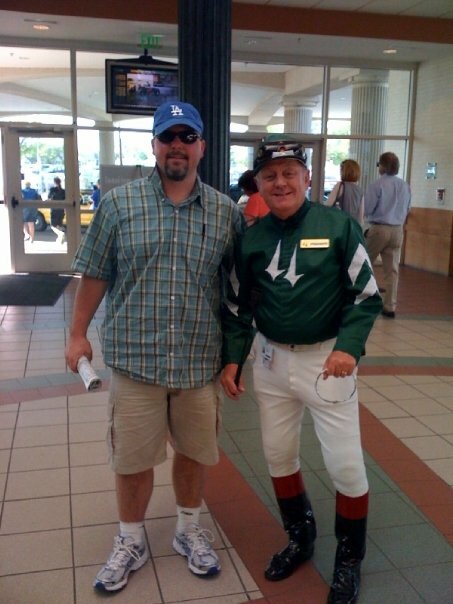 Here's a picture of me in 2009 getting ready for a non derby race day at Churchill Downs.